Little bites of heaven! An amazing Greek dessert that despite being an indulgent delight still complies with the dietary instructions of the Lenten season! These traditional Greek sweet little honey puffs are definitely one of my favourite desserts, so I was excited to prepare a dairy free Lenten alternative, which is equally delicious as the traditional Greek honey puffs. Loukoumades are little bite-sized fluffy Greek honey puffs, which are deep fried until golden and crispy, soaked in honey and garnished with chopped walnuts and cinnamon. Simply irresistible! The perfect Greek honey puffs are crispy and golden on the outside and fluffy and airy in the inside. To achieve this perfect texture make sure to use self rising flour and yeast to help the dough to rise. Give it time to rise and it will reward you with its distinctive air-y fluffiness. Dissolve the yeast in lukewarm water and let the dough rise in warm environment. If the room temperature is low, a little trick is to preheat the oven to 40-50 C, turn it off and place the dough in the warm oven. Maybe the most important part when preparing Greek honey puffs is the ratio between water and flour. Some experimenting has shown me that the more liquid the batter, the more fluffy the honey puffs will become. If you try adding a little bit less water, then the shape will be more elegant, but a little bit heavy on the inside. Using corn starch in the dough helps the honey puffs become more crispy and crunchy on the outside. Frying the honey puffs the right way is the key to success. Make sure to fry them in batches, so that the surface off the pan is comfortably filled, otherwise they will probably stick together and the temperature of the oil will decrease. 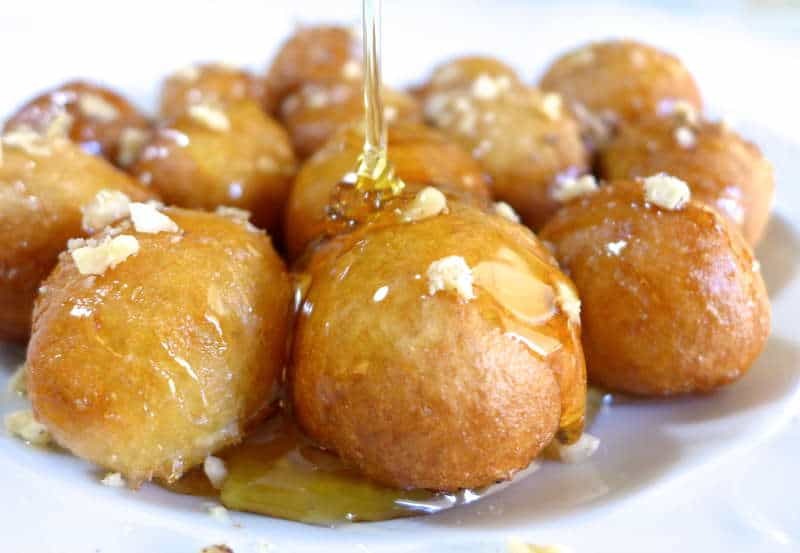 You don’t want your honey puffs to become mushy and less crunchy on the outside… Enjoy this delicious Greek Lenten dessert while still hot with a drizzle of good quality honey and chopped walnuts! yeas this is nice cooment.